A Living Will. Sounds a bit conflicted. Aren't wills supposed to be for the dead? As in my Last Will and Testament? Yep, I know about those. A will is a legal document with written instructions about what should happen to my body and the things that I own after my death. So a Living Will would be a legal document with written instructions about what should happen to my body before my death, while I'm still living, but am unable to tell you what I want. The easy part is that I'm still living, the hard part is that I may not be able to tell you what I want, or what should happen to my body. Sounds like my worst nightmare. Mom's too. And it would be if she didn't already have a Living Will and a healthcare proxy. As a nurse, mom knows better than most how far the medical field has come. Extraordinary life support can now keep a body going long after the will to live has given up. This Advance Directive gives her control over just how much or how little intervention she will want as she nears the end of her life. Sounds like it would be complicated for those of us not in the medical field. How would I know what I want and what I don't? 1) Resuscitation. This restarts the heart when it has stopped beating (cardiac death). Determine if and when you would want to be resuscitated by cardiopulmonary resuscitation (CPR) or by a device that delivers an electric shock to stimulate the heart. If you choose not to have resuscitation, then a Do Not Resuscitate order can be made part of your advance directive living will. 2) Mechanical ventilation. This takes over your breathing if you're unable to do so. Consider if, when and for how long you would want to be placed on a mechanical ventilator. 3) Nutritional and hydration assistance. Supplies the body with nutrients and fluids by i.v. (intravenously) or by a tube in the stomach. Decide if, when and for how long you would want to be fed in this manner. 4) Dialysis. This removes waste from your blood and manages fluid levels if your kidneys no longer function. Determine if, when and for how long you would want to receive this treatment. This document can easily be drawn up by a lawyer and be made part of your advance directive. But don't stop there, it's important to talk with your closest family members and let them know your wishes. As mom's pancreatic cancer progresses and becomes truly terminal, she has made sure that we all know her most emphatic wish is not to be kept alive on machines. She desires to die as she has lived with grace and dignity. Will it be hard on us? Yes. But will there be peace? I pray so daily and believe that mom's courage to face these decisions now will pave the way for us to honor her in love when the time comes. And that's why every one of us needs to consider Advance Care Planning. Still not convinced? Too overwhelmed at the thought of getting a lawyer on top of all the medical personnel you're dealing with? Then let me make it even simpler. 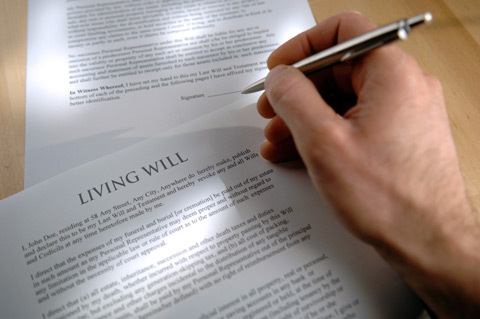 Take a look at one of the most popular Living Wills around. It's called Five Wishes and it has been designed to be easy to use, and lets you say exactly how you wish to be treated if you get seriously ill (as in terminal pancreatic cancer seriously ill). Some have said it is the first Living Will with heart and soul, covering your personal, emotional, spiritual wishes as well as your medical needs. 5 wishes. That's all. Doesn't sound too hard, does it? If you are interested, you can get an overview right here. So, now we know what a Living Will is. And more importantly, we know why we need one. All this Advance Care Planning sounds like work, but I believe you already know all the answers. Take a few minutes and put it into writing for your loved ones. It is the Best, Last Gift you can give them. And if all this talk of wills, end of life care, and advance directives has got you down, then can I suggest a little light-hearted reading? Head on over to Pull the Plug, Reel in the Tubes and Call it a Day, for a quick smile.